Wish you could make or receive calls from one phone number, from anywhere in the world, and with the other person being none the wiser? Thanks to Google Voice and Skype you can easily do just that. Here’s how to make the cheapest international phone plan for travelers that you can imagine. Make unlimited calls to landlines in dozens of other countries around the world. Technology is pretty crazy isn’t it? In Tim Ferriss’ iconic book the Four Hour Workweek there is a chapter titled How to Escape the Office. For those not yet willing or able to leave the security of their jobs, he advocates (when possible) slowly removing yourself from your physical job via remote work. It could be as simple as one-day of telecommuting which you then parlay into full-time. Unless of course your boss is trying to call you and he can never get through… That’s a big red flag. One story in the book tells of an HP employee who parlayed his remote work assignment into working full-time overseas in China, and had his calls forwarded to his girlfriend’s cellphone in China. His boss had no idea he was on the other side of the world. 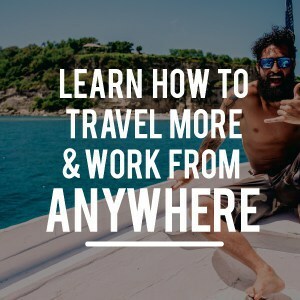 Why Make a Digital Nomad Phone? Being able to receive calls while traveling overseas from a local domestic phone number is important, not just for disappearing from your job as mentioned. But also just for being more easily reachable by friends and family or other important personal calls. No need to try and pass along your new phone number to all your contacts, and no interruption in service. That way your friends, family, or boss can keep calling the same ol’ number and you’ll be able to answer them whether you are in Akron, Ohio or Bangkok, Thailand. Not only that, but you can also call them on that same phone number (as shows on their caller ID) from anywhere in the world. You’ll also avoid that confusing conversation of why you’re calling from a strange new phone number, but in order to call you back they have to call your Google Voice number… No, just one number for inbound or outbound calls. Just a smooth transition where no one will be the wiser as to what’s really happening behind the scenes. 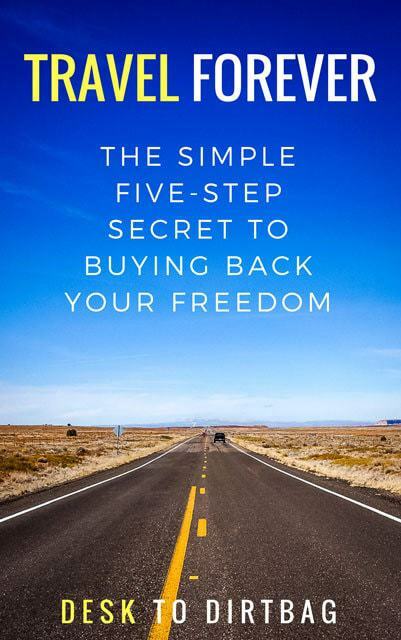 This approach is obviously ideally suited for digital nomads… More like, why haven’t you already done this? But it’s certainly not just for them. You may want to consider doing it even if you have no immediate plans for overseas travel. Cell phone plans in the United States can be very expensive. You can save significant amounts of money by making the transition to either a data only plan, relying solely on WiFi (unless you’re traveling, you’re probably on fast WiFi for 80-90% of the day), or utilizing the cheapest prepaid, pay-as-you-go plans available. Since your existing phone number is no longer attached to any particular provider, you are free to move around and take advantage of the best deals as you see fit (there is lots of competition, think: Virgin Mobile, AT&T GoPhones, Straight Talk Wireless, Boost Mobile, etc). How Does This International Phone Plan Work? So the gist of the process is transferring your existing cell phone number (or even port your home phone number) to Google Voice ($20 one-time fee). Then utilizing a Skype calling plan like their Unlimited World Plan ($14 per month) and picking up a Skype Online Number (normally $60 per year, but 50% off if you have a calling plan). You then set your Google Voice number to forward to your Skype Online Number which will call you via Skype whenever you are online (on both your laptop and smartphone). Voicemails and text messages will be handled via Google Voice and Hangouts, which also includes decent transcription of voice messages that arrive via the app or email. 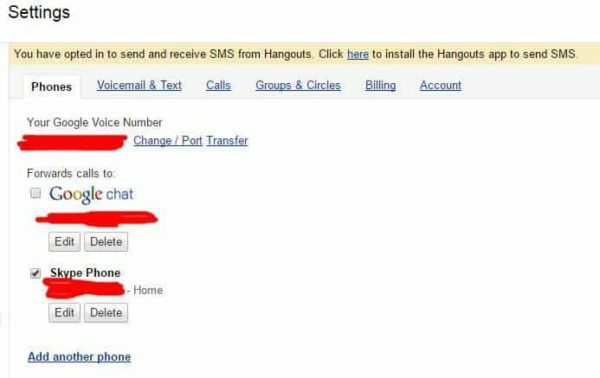 You can also send SMS messages via Google Hangouts. If/when you return home, you can get a cheap prepaid plan, and you can easily change your Google Voice to forward to your new phone number if you like. So for a small fee of $16.50 per month (I’m not including the one-time Google Voice fee) you can make and receive unlimited calls via WiFi. Why Not Use Google Voice Exclusively? You could use Google Voice and the integrated web apps to make and receive phone calls… Indeed calls to Canada and the USA are 100% free. 1) I’ve found call quality to be much better over Skype than Google Voice. That may have changed, but all reports seem to indicate that Skype is optimized for calling over the web, while Google Voice is optimized for use over cell phone networks. 2) Skype’s International Unlimited World Plan includes unlimited calls to cellphones and landlines in 8 countries (USA, Canada, China, Guam, Hong Kong, Thailand, Singapore, and Puerto Rico) and unlimited calls to landlines in 63 countries (check out the full list here). 3) With Skype’s smartphone app, and a few settings tweaks, I can always be available for incoming calls when online, and don’t need to have the laptop on. WiFi is ubiquitous throughout most of the world, and you could pretty easily just rely on making or receiving calls while connected… If you aren’t online, calls will go to your voicemail and you can just return them at a more convenient time. 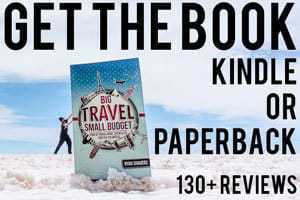 But you could also just grab a cheap prepaid data plan wherever you are traveling for 3G or 4G data and use the Skype app to make and receive calls while you are not on WiFi. An important feature is that you can call out with Skype and have it display your Google Voice number–that way you maintain the same contact number in the phones of friends and family no matter where you call them from (and don’t get confused when you have a new “throw away” number). I love the fact that you have unlimited calls to landlines in 63 countries… It isn’t quite everywhere, but it’s still a huge chunk of the world, and it definitely makes for the best cheap international phone plan out there. While we drove through Central America, I often used my Unlimited World Plan to call ahead to local hotels or reach out to other businesses as we were traveling through. That meant I didn’t even need to buy a SIM card in many countries thanks to my existing Skype plan. Voice only calls via Skype are not very data intensive and since only one of you is connected to the Internet (unlike a Skype-to-Skype call) I find that the speed and quality of the conversations are excellent on most connections. With a decent wifi connection, the call quality is often so good that you cannot find a noticeable lag in conversation and doesn’t at all seem like you’re calling the other side of the world. Making or receiving calls over a 4G data plan might not be quite as good, but it’s totally usable. I’ve had it break up and feature some lags at times, but again very usable. You can always chalk it up to a bad connection, and not the fact that you’re sitting on the beach in Mexico. So I’ve had my same old Verizon phone number since the beginning, ever since high school. From friends and family to banks and former employers, that’s been the number I’ve always used and where I could always be reached. I would normally suspend my service for up to six months per year with Verizon. Up until recently I had never traveled out of the USA for more time than that, so it was always perfect. Just suspend your service, don’t pay anything, and then come back and everything is like normal. But then more recently as I began to stay abroad for longer periods of time, I ran into the limit. After reaching the six month maximum for suspension, you can report your phone as lost or stolen to suspend your service (I was told to do this by a Verizon employee), but you must remember to do that every single month or they will bill you. Sometimes I would miss the date and then they would charge me or something would happen and they’d reinstate service. It’s a hassle, but I didn’t want to pay an arm-and-a-leg for something I was not using whatsoever, but I also didn’t want to lose the phone number I’d had for 15+ years. Then one day after receiving a bill for two months in advance which was more than $150 (again, for something I’m not using at all), I had reached my limit and called Verizon to cancel the service outright. The guy talked me down by downgrading my plan to a really old pre-smartphone phone that was on my account, which then allowed him to downgrade the plan to one without data and the minimum minutes. It was still $25 per month, but much better to receive a surprise charge at that rate, than for one that’s $75 per month. I think Skype is an integral part of this process and is worth the extra expense. But there are plenty of people who rely solely on the Google Voice service for free calls to the USA and Canada. I recommend getting setup with the Unlimited International Plan for $14 per month or another suitable regional calling plan. To do so, login to your Skype.com account and click on Add Subscription. Once you’ve got a plan, you can also purchase a Skype Online Number at a 50% discount ($30 per year instead of $60). The number you choose for a Skype Online Number doesn’t really matter since you won’t be giving this number out to anyone. To purchase a Skype Online Number, you can do so within your account under Manage Features. The next important step is to make your existing phone number (the cell phone number we’ll be porting to Google Voice) as the phone number that displays when calling from Skype. That way you will maintain consistency in the saved contacts and caller IDs of everyone you know, and they won’t be receiving calls from a strange new number and asking if that’s where they should call you or worse, receive calls from you at an UNKNOWN number and not answer because they think it’s a telemarketer. 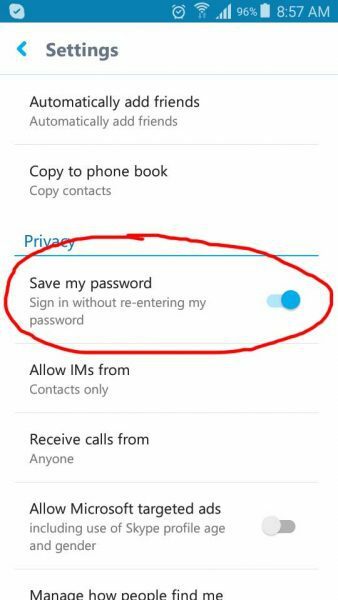 To do so, login to your account on Skype.com and under Manage Features, select Caller ID. You will need to verify that you own the existing phone number with a code that they send via text message. Warning: I still had my traditional cell phone service when I completed this step, though there are reports of people verifying their Google Voice numbers successfully (since SMS messages arrive by email or hangouts). One of the first things I did upon returning to the US was to try to transfer my Verizon number over to Google Voice. I say try because you need to have an active phone service to confirm your number with Google and authorize the transfer. Problem was I couldn’t get my unlocked smartphone (Samsung Galaxy A3) to play nice with Verizon (CDMA and GSM, I guess?). I was really frustrated, thinking I’d need to buy a cheapo phone just to have active service with Verizon to transfer over my old phone. Thankfully it occurred to me that we still had some of those old clam-shell flip phones around just in case. Amazingly, the old LG phone which hasn’t been used in YEARS still had a charge! Remember when you only needed to charge your phone like once per week? I was able to use Verizon’s *228 on the phone to activate the line by then putting in my phone number and last four of my Social Security Number. Boom, I had cell phone service again. I immediately went to voice.google.com and started to initiate the number port / transfer (located under settings). First you will need to punch in your phone number in order to confirm that it can be transferred over. In order to actually proceed with the port you will need to have the account number of your existing cell phone provider, your name, address, last four of SSN, etc. After filling out the short application you will then need to pay a one-time fee to Google via Google Payments. It states that the porting process can take up to 24 hours to take effect and up to 3 days for SMS. That was it, now just time to wait. The next day, about 22 hours later, I received confirmation that the porting had been completed successfully. Since I already had an existing (free) Google Voice number, my newly ported cell phone number would be replacing it. Google would keep the existing number on hand for 90 days and it would then be deleted permanently, or you could pay another $20 fee to keep it forever. I didn’t care about the old Google Voice number so I just deleted it right away. Once the line is activated just have your new Google Voice number (your old cell phone number) forward to your new Skype Online Number (which displays your Google Voice number as the caller ID). Some people may not want to cancel their cell phone service, but simply get a new phone number with their existing provider for the time being. There are other reports online about successfully doing it, you’ll just need to request a new phone number from your cell phone provider before the porting is completed. There isn’t much that you need to do, they’ll work great together as is with the exception of perhaps your voicemail. I would simply recommend turning off the voicemail feature for Skype and using Google Voice. Google Voice allows much more control and flexibility including custom voicemail greetings for different contacts, voicemail transcription which appears in Hangouts or via email, and much more. 1) Ensure that under Privacy, the option to save your password and sign in without re-entering your password is active. 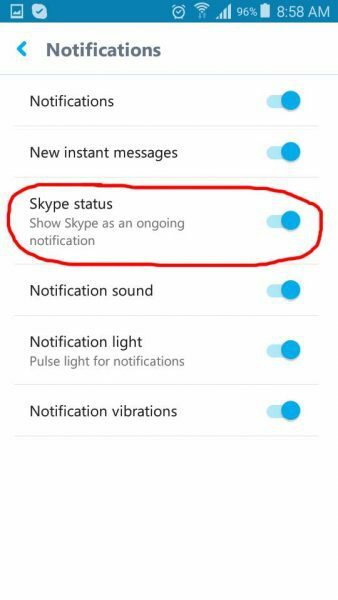 2) Under Notification Settings, ensure that Skype Status is set to show as an ongoing notification. Without ensuring those options are active, you will not be able to receive calls on your cellphone and have the chance to answer them, they will just go to your voicemail unless you have opened the app. This ensures that even upon rebooting your cellphone that you will remain available for incoming calls. 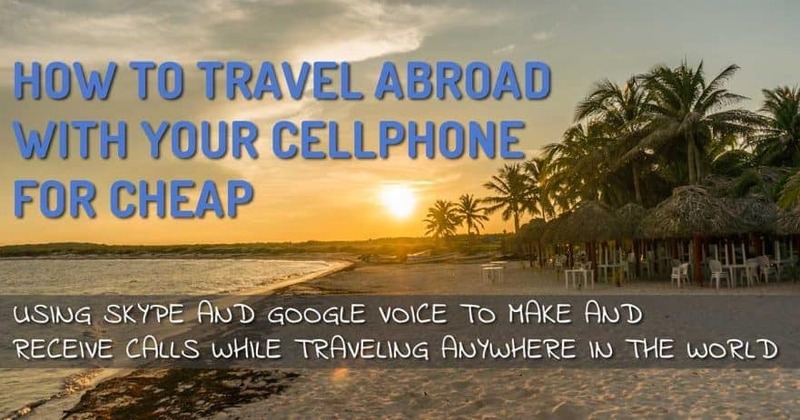 So there are two distinct differences in how and when you’ll be placing calls, those while traveling abroad and those while at home and using a cell phone plan (perhaps as a throwaway prepaid SIM). So I bought a cheap AT&T Go Phone plan to use while I was at home for a few weeks. That means that I got yet another new phone number. I obviously don’t want friends or family to think that it is my new phone number and try to call me back. Of course, it would work while I am at home, no problem, but once I left the USA that number would be discarded. Much better to place outbound calls using my Google Voice number. 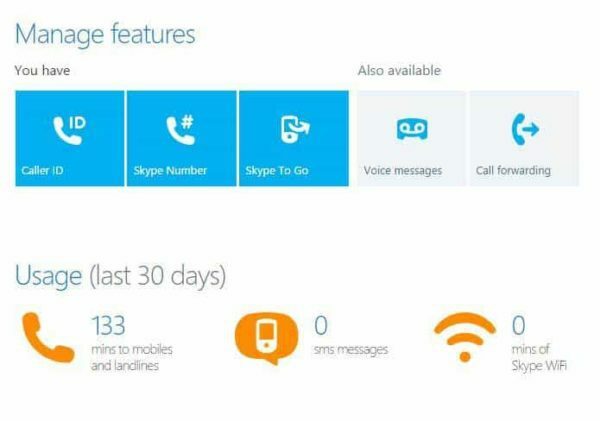 1) Just use Skype as your dialer using either WiFi or a data plan. 2) Dial your Google Voice number from your disposable SIM, enter your PIN, and hit option 2 to allow you to dial outbound calls with your Google Voice number. 3) Use Skype-to-Go, an included service with the Unlimited International Plan, to dial in and call anywhere in the world (within the plan). You can save frequently contacted people with their own local phone number (even if they are an international contact) to be automatically connected. Admittedly, it’s a little more convoluted, but most of us spend the vast majority of our day connected to WiFi and can easily use the Skype app. 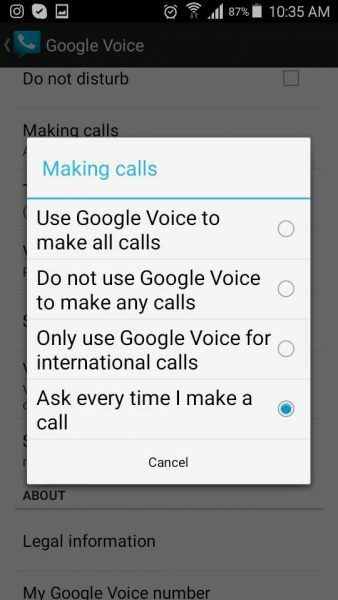 Within the Google Voice app on your phone you can set the option to make Google Voice (aka Skype or Hangouts) your default for every phone call placed in your native dialer or to ask you each time whether you want to use Google Voice or not. While you are overseas, you will be making and receiving calls exclusively through the Skype desktop application or the Skype smartphone app. It will ring you wherever you are online and on whatever devices are currently online (it could be both your desktop and smartphone). Follow the instructions above for ensuring you are always online on your phone in order to receive calls. When someone calls, it pops up as a Skype call, just click answer. If you want to call someone I would recommend doing so by opening the Skype app and using the contacts or dial pad within the app. And using the native phone dialer as a local phone with a local SIM card. As mentioned earlier, within Google Voice you can set the option to ask each time you want to make a call using your built in contacts though that may not be ideal if you have a local SIM card with local minutes. Each case and country might be a little different. I use the native phone dialer as my default and just manually open Skype to call contacts overseas. You may prefer to have Skype be your default dialer if you spend more time calling back home. As mentioned earlier there are various levels of reachability you may want to maintain depending on your circumstances. Level 1 Reachability: The most basic and affordable is using Skype Unlimited World and a Skype Online Number solely through WiFi, which will run you about $16.50 per month. Level 2 Reachability: The next level would be to get a data plan on a local SIM card in order to make or receive calls through your data plan when you are out and about and not connected to WiFi. Those plans will vary by location, obviously, but here in Colombia I pay about $20 per month for 1.5 gigs of data (and loads of minutes and messages that I can never use). Level 3 Reachability: The ultimate reachability would be to have your Skype Online Number (aka your Google Voice number) automatically forward to your overseas local phone number when you are not online (or when you have neither WiFi nor a data connection but still get bars for phone calls). If you are not in one of the 8 countries which include unlimited cell phones in the Unlimited World plan, then you will need to supplement your Skype account with additional credits or a regionally specific plan in order to receive incoming forwarded calls (using minutes, not data). Basically, your friend is calling a local number (your Google Voice, aka old cell phone number) which then forwards to Skype, if you aren’t online whatsoever, it will forward the call to your overseas phone number using YOUR Skype credits. Plans vary, but 400 minutes per month to landlines AND cell phones in Colombia through Skype would cost $3.99, and unlimited to both costs $6.99. You could supplement your Unlimited World Plan with one of these as well. Personally, I don’t find that Level 3 Reachability is necessary for me, but someone with more pressing work or family situations might appreciate it. I go for Level 2 Reachability here in Colombia when I’m settled down for a little while, and Level 1 Reachability when I am traveling and on the move. With Level 2, I’m connected to the internet most of the time and can easily make or receive calls 90% of the time, while the other 10% of the time is probably when I’m not likely to answer the phone anyway, like if I’m walking down the street or somewhere I don’t feel comfortable answering due to potential robbery. With Level 1, I connect online once a day or every few days and can easily see all of my missed calls (which also arrive as emails in your inbox) and voice mails, and then return the calls while online either via my laptop or cell with Skype. I also can’t emphasize enough how important it is that you have an unlocked phone. Most carriers in the US have blocked their phones to only work within their network. Even if they are international capable phones, like my old Verizon Samsung Galaxy S3… It would technically work overseas with a new SIM card, at least for phone calls and SMS messages, but would not allow data. I knew that it wouldn’t, but still spent a few hours with a technician in a cell phone shop in Mexico who swore he could make it work without rooting my phone. It kind of, sometimes worked, but not really. Verizon does a good job of keeping you chained down. You can often find someone to root your phone, therefore unlocking it, but you usually must leave your phone behind for a few days or even up to a week. Not ideal. I ended up buying an unlocked phone in Mexico after my Galaxy S3 finally bit the dust. It cost me around $300 for a Samsung Galaxy A3, a pretty decent phone which has served me in a number of countries throughout Latin America and the US. The Samsung Galaxy J7 is a great phone, albeit a bit large, which comes unlocked on Amazon.com and even features a dual SIM card slot (so you don’t have to lose your original card while traveling). Best part? It’s only $200 online and arrived super fast thanks to Amazon Prime. It was about $40 cheaper on Amazon than it is in Colombia. Making a cheap international phone plan like this, which allows you to call out and be called on the same number from anywhere in the world, and for just $16.50 per month, is pretty amazing. Technology is outstanding really and even if you’re traveling to get away from it all, doesn’t mean you still can’t be in reach, at least sometimes. I really, really recommend that any traveler consider the Skype and Google Voice combo to maintain contact while on the road. It’s affordable and works amazingly well. Find this post helpful about cheap international phone plans? Please take a second to Like it and Share it with friends! I’m looking into all my phone options for my upcoming time abroad – and I definitely have to keep my current number for my clients. In my research, I found your article and also came across something called NomadPhone (https://www.nomadphone.com/). Ever heard of it? If yes, any thoughts on it & why you chose the GoogleVoice/Skpe option? Hey Leslie, I hadn’t heard of NomadPhone, but upon looking at it my thoughts are that it is like a stripped down version of what I have with Skype. You can get basically exactly what they are offering right now for free by just porting your number over to Google Voice, except NomadPhone charges $10/month. By adding on Skype, I get the ability to call international phone numbers within my subscription. If you only need to call the US/Canada, I’d say just port your number to Google Voice and go with that. Great article! 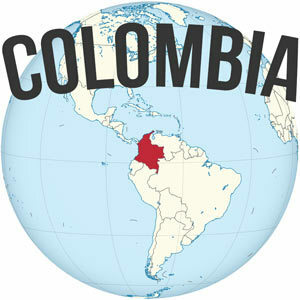 Where in Colombia are you? I am an expat living in Cali. I was wondering if you could give me some phone advice. I canceled my US plan a long time ago and have since been using a skype number that forwards to my local Colombian phone number. I’ve got 2 questions for ya. 1. Is there any sort of hack I can do to be able to receive SMS messages to my skype number (or a number with a US calling code)? There are some US companies that only allow you to verify your account with a code sent via SMS (e.g. I can’t log into my venmo account without a phone number that can receive a SMS code), so it would be nice to have a number that could receive them. You mentioned that it works with Google Voice, but I don’t know if I can utilize that since I canceled my actual US cell plan a couple years ago. 2. Is there any advantage to forwarding calls from my Skype number to my local Colombian number? Would the difference just be that if I forwarded to my Colombian number, I would be using my local plan minutes instead of using wifi (or my local plan data if I don’t have wifi)? That’s where it gets a bit confusing for me. Thanks for the advice! If you’re ever in Cali and want to grab a beer, let me know! I’m based out of Medellin, although back in the USA right now. 1) I’m not aware of any hack to be able to do so with the SKype number unfortunately. You *may* be able to use a VPN to pretend you are in the US, and then sign up for a new Google Voice phone number, but you need to have an existing US phone number to do it. I don’t remember, but I think you can verify the the number (your Skype number in this case) by asking Google to call the number rather than sending an SMS. Give it a shot. Else you might have to wait until you visit the US again in order to get a google voice number which you can then use for SMS messages. 2) The advantage of forwarding your local Colombian number would be that you can still get calls when you don’t have wifi or a strong data connection. I suppose if you travel out of the city quite a bit, then it is worth doing, or if you don’t have a data plan — otherwise you can probably stick with using the app on wifi or data (which is what I do). Wow, 16.50 a month to be contacted from anywhere in the world at the same number? That’s insane, I’ve never heard that before… Technology truly is amazing. Yep, I love technology! Awesome to be able to call and be called on a USA number (the same as always) no matter where in the world I am. Hi! This is amazing, I left this week for an extended international trip and have been following this advice – thank you! So I’m in Costa Rica with my ported Google voice number forwarding to a Skype number I bought, and also just got a local sim card. The only problem I’m having is with placing outbound calls, and I’m not fully following your instructions on this part. Whether I place a call to the US from the Voice app or native dialing, it says “We could not complete your call. Please try again.” I have google credit and am also using wifi at the moment. 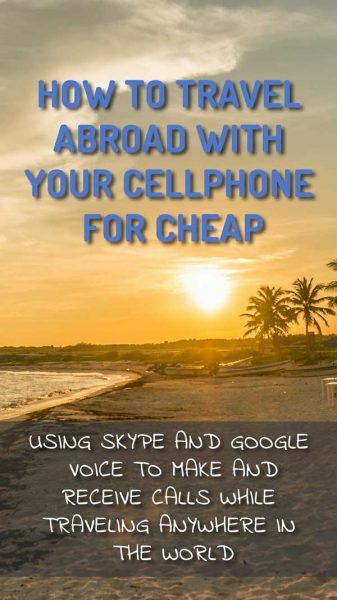 You also wrote something else which confused me: “While you are overseas, you will be making and receiving calls exclusively through the Skype desktop application or the Skype smartphone app. ” I just tested making a call using just the Skype app and my friend did not see my phone number that I had ported to GV, which is the whole point of this right? When calling from Skype it just shows the Skype number or blocked caller ID. Any advice would be greatly appreciated, I’ve been reading a bunch of google forums and still don’t have an answer as to why GV is giving me that message. I’m hoping that I’ve just missed something in your instructions and you can help! Hi Sarah — let me try and clarify… Yes, I use Skype exclusively to make and receive calls. You shouldn’t be able to make a call with the native dialer for calling back home (that would be using your Costa Rica sim). You should be able to use Google Voice so long as you have WiFi or data (even without credit) — so I’m not sure why you are getting an error. I just don’t use Google Voice, since I had found Skype to have better quality… And I’ve never had a problem placing outbound calls (with my Skype unlimited world plan). In terms of Skype, you will have to enter your account via your web browser — there you should see Caller ID, change this number to your previous number (your Google Voice number). You will be asked to verify the number, but then it should appear on the Caller ID of your friend. I’ve never had anyone report seeing my Skype to Go number, it shows my GV number. If you are online on Skype, they will ring through to you on Skype. Outbound calls placed through Skype will show that number. Does that clarify anything? Hit me up with any more questions. Thanks Ryan! Have you found anything similar for Canadians? I’m heading off around the world for a year and it looks like Google Voice is only for US phone numbers. Hi Michelle! I’m European and am facing the exact same issue. On top of that something very important for me is being able to receive text messages for my online banking, something that is an issue with many VoIP providers. I ended up building a DIY set-up consisting of a Raspberry Pi and an old 3G dongle where I put in my existing SIM card (a duplicate works best) and leaving that at home. I then hacked up something very basic allowing me to use it over the internet, wherever I am. I’d love to see a full-fledged cloud platform with a nice shiny app and a dedicated device hosting the SIM card to help streamline this process and make it easy for everyone. Ideally I want to have one device set up in each country I have business ties to and use all of them from anywhere by simply getting a local unlimited data plan. Do you think you could see yourself using something like that? Great article! Great info! I got rid of my phone back in January and have been using a Google Voice account along with the app and Hangouts (all free) on my iPod for 6 months and it works great! Next time I travel abroad I’ll check out using Skype.